Mutabal and Baba Ghanoush are the two most common recipes I get asked about, so I decided to re-publish how to make Mutabal in a proper recipe post rather than my previous "scientific paper" post. 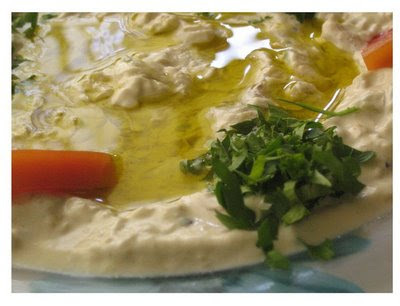 Along with Hummus, this is the most common Mezze dish. You will see it on every table in every Syrian restaurant. The dish basis is char grilled aubergine. This gives Mutabal its characteristic smokey flavour that works a treat with BBQ. There are some variations to this dish. You can use deep fried aubergine instead of the grilled one. This is as delicious but could be a bit oily if the aubergines are the large variety you can buy in the UK supermarkets. The other main ingredient in this dish is Tahini. For those who don't know it, it is sesame seed paste. You can buy it from middle Eastern shops as well as large supermarkets. Start by placing the aubergine whole directly on open flame and cook it till it is charred on the outside and soft on the inside. Turn around every few minutes so it is charred all over. This method gives the dish its characteristic smokiness. No other way of cooking can give you that exact flavour. Grilling in the oven doesn't work but you can put your aubergine directly on electric or halogen hub. The cooking process should take 15-20 minutes. After you cook the aubergine, cover with cling film for 20-30 minutes. Remove the charred skin, it should come off easily, then mash the aubergine with a fork. Add the rest of the ingredients. There is no exact amounts, add more or less till you get the taste you like. I use equal amount of tahini and yogurt. Yum! Thanks for clearing up the difference between the two dishes. I've made mutabal many times (though never by that name), but never realised the addition of yogurt was important. I'll definitely be trying it this way next! I like to add yogurt as it balances the taste. I know some people use tahini only but people in Syria mostly use yogurt and usually more yogurt than tahini. I'm really interested to try it with the yogurt. I can see how it'd balance it out more nicely. Next time I can hold onto an eggplant long enough to char one, I'm making it! Do you ever make makdous? I am seriously addicted to this stuff. I looooove Makdous but I never tied to make it myself. I buy ready made ones although it is hit and miss depending on the brand. There is a very little known Green beans Makdous. This one I make at home. Good but not as good as the aubergine one. I've never made it either, though I love it so much I can't even express it. I buy it at the olive bar of this store I shop at. Green beans makdous? I've never heard of such a thing? How's it made? What's it taste like? Most people in Syria never heard of it! It is easy to make. boil the green beans, salt them and put them in a colander with heavy weight on top to get most of the water out. You need to press them for 24 hours. Dry on kitchen towels. The more water you get out the longer it last. Prepare makdous stuffing by mixing walnut, red chilli/red pepper paste, garlic and salt. Mix the stuffing with the beans. Put in a jar and cover with olive oil. Let the flavour develop over couple of days. Mutabal is one of my husband's favourites. Gotta try this one. I'm really glad I found your site. Sure, I have cookbooks for the region but this is better, plus you seem to be willing to answer questions if needed. Thank you, I am very flattered! I am always more than happy to answer question. Please feel free to ask me anything even if I haven't blogged about it yet. Wow! Thanks, how can I resist such an offer? One of my favourite restaurants in Bangkok does superb Middle Eastern food (yeah, I know, but I like Thai food too). They have a dish they call BBQd lamb. It's wonderful. I'm pretty sure it's lamb shanks, but I don't know how they cook it. (I guess I could ask the owner sometime as we're quite friendly with him and he's always pleased to see us enjoying a good scoff at his restaurant.) Anyway, the meat is so tender it falls off the bone, but it's the fragrance, the aroma, of this wonderful dish that I'd like to master. Any ideas? You live in Bangkok! I feel so jealous. I would love to go live there for a year or so. I am not sure about this specific dish. A Syrian restaurant here is London serves something similar. A lamb shank with little spices few carrots and potatoes, wrap the whole thing in few layers of tin foil and they throw it on the char coal grill for couple of hours. Hello, just to say that I hope your family and friends in Syria are alright at this turbulent time. Have been hoping that all is well, and thanks again for your generous postings. Thank you very much for the kind thoughts. My family are worried about what is coming next but they are otherwise fine. This is a dish you do the way you like. Add more or little ingredients as you fancy. Falling in love with all the delicious food on your blog. Welcome to my blog. Apologies for the very late reply.